^ a b c プルタルコス,p.18. ^ a b 土井 1994,p.52. ^ a b 土井 1994,p.53;土井 1977,pp.163-164. ^ a b c プルタルコス,p.24. ^ a b Appian, Civil Wars, 1.120. ^ a b 土井 1977,p.5. Fields, Nic (2009). 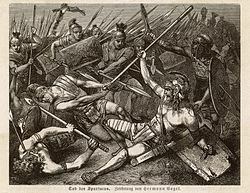 Spartacus and the Slave War 73-71 BC: A gladiator rebels against Rome. Osprey Publishing. ISBN 978-1846033537.